Konga Beat in Super Smash Bros. for Wii U.
Konga Beat (タルコンガビート, Barrel Conga Beat) is Donkey Kong's Final Smash in Super Smash Bros. Brawl and Super Smash Bros. 4. Donkey Kong gets his bongos out and plays them. This involves him creating shock waves to attack his opponents. The announcer says "Ready? Go! ", then part of the "DK Island Swing" song from Donkey Kong Country plays, with DK clapping and playing the drums. If a player does not press any buttons, the shock wave created just barely covers DK. However, the player can increase the power and range of the attack by timing their button presses to the beat of the music. When a player press the attack button to the beat, he claps or strikes the bongos, creating a forceful wave each time. The strong shock wave's diameter is a bit bigger than Final Destination, while the weak shockwaves have a vacuum effect, making it harder for foes to escape the player's stronger, better timed waves. During the Final Smash, DK is invincible but immobile. If it is used at the wrong place and the wrong time, the other players can dodge the entire attack simply by staying away from DK. The immobility can also cause other problems - in scrolling stages like Rumble Falls, DK may be taken away from the screen. This is reduced somewhat as the Final Smash slows down the stage while it's in use, though it can still result in DK becoming vulnerable near the edge when the move ends. Using the move in midair will cause DK to scroll with the screen. Konga Beat returns in Super Smash Bros. 4. It now displays a rhythmic tracker and can be made stronger. As the attack begins, red circles will appear and shrink upon the bongos. These rings serve as a timing aid, if the player presses the attack button when the ring lines up with the drums, he will get a large shock wave that can do 15% damage or so. Alternately, the player can hit the button just as DK raises his hands to strike the bongos. If the player does four successful beats in a row, Donkey Kong will clap, creating a shock wave that has more knockback. In Super Smash Bros. 4, this has been replaced with an indicator bar that circular beat symbols pass through; pressing the button as the indicator passes the circle on the left side of the bar will strengthen the attack. 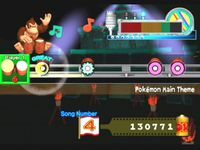 The bar also keeps track of the number of correctly timed beats performed in a row and will display a message saying "Good", "Miss", or "Great" each time the player attempts to match the beat. The bongos Donkey Kong uses as seen in the Donkey Konga series. Bongos were Donkey Kong's musical attack in Donkey Kong 64 for the Nintendo 64. They would later play a more important role in the GameCube rhythm game, Donkey Konga, and its sequels, Donkey Konga 2 and Donkey Konga 3, and were used as the controls for Donkey Kong Jungle Beat. In fact, the bongos DK uses for Konga Beat are almost an exact replica of the bongo controller used for Donkey Konga. The final smash involves Donkey Kong hitting the bongos and clapping in between; and the player pressing the A Button within rhythm with accurate timing, which are a translation of the gameplay of Donkey Konga. 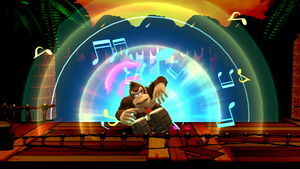 In Donkey Kong Jungle Beat, Donkey Kong could make similar circular waves by clapping to stun the enemies. The name of this move is a portmanteau of Donkey Konga and Donkey Kong Jungle Beat. The new timing indicator in Super Smash Bros. 4 is directly copied off the timing indicator used in the Donkey Konga games. Konga Beat trophy in Brawl. DK about to go to town with some bongos! His performance is so magnificent and upbeat that it creates damage-inducing sound waves. Press the buttons in time to the music, and the sound waves may grow stronger. DK's invulnerable when launching this attack, but he's also immobile, so be careful using it on scrolling stages. Konga Beat trophy in for Wii U. In this Final Smash, DK drums on a set of bongos, just like in the Donkey Konga games. Press the attack button in rhythm with the circles to boost the attack's range and power. Enemy attacks won't affect you, but you can't move, either. Auto-scrolling stages will slow down but won't stop-don't get too carried away in the beat! In this Final Smash, DK drums on a set of bongos, just like in the Donkey Konga games. Press the attack button in rhythm with the circles to boost the attack's range and power. Enemy attacks won't affect you, but you can't move, either. Auto-scrolling stages will slow down, but be careful or you might still self-destruct! Donkey Kong about to play his drums in Brawl. DK's Konga Beat at full power in Brawl. DK about to play his drums in Super Smash Bros. for Nintendo 3DS. Konga Beat is the only gameplay move in the entire Smash series that invokes the Announcer. While the announcer says "Ready? Go! ", there are two extra beats that the player can make. If used during a stage-wide slow-time effect (such as those caused by Dialga, Slow Brawl, or Training Mode), the shock waves created by a perfect beat can grow to enormous size because the timing can be even more accurate. A high level CPU will perform this perfectly, and the shock waves produced will be stretched, blurry, and semi-transparent. In the same way, a perfect beat is much more difficult to accomplish when time is sped up during a Fast Brawl. Hitting all the notes perfectly will have DK give a thumbs-up at the end of the move instead of his usual bicep-flexing gesture. If a match ends and Konga Beat is still active, the indicator bar will disappear. The 3DS version will mute several vocal and attack noises during the Final Smash, presumably to reduce processing strain. This applies to all versions of the 3DS console family. In Super Smash Bros. Ultimate, there is an unused model of the bongo drums with a more updated design than in Smash 4, suggesting that the Final Smash was meant to return in Ultimate, but was scrapped in favor of Donkey Kong's new Final Smash, Jungle Rush. This page was last edited on April 7, 2019, at 23:04.